Congratulations to our Client Cogito for their feature onÂ FSHN Magazine! 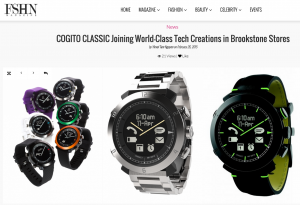 COGITO CLASSIC, the beautifully designed smartwatch with the sophistication of a precision-crafted timepiece, is joining the ranks of high quality tech products featured at Brookstone stores across the nation. COGITO CLASSIC appeals to both the techie and grown-up in each of us. Combining classic analog movement with all the essentials of a smartphone, itâ€™s the ultimate accessory for the tech lover who values function, but doesnâ€™t want to trade fashion to get it. Simply link COGITO CLASSIC to any smartphone or tablet using the app, and use its customized settings to choose priorities and which notifications will appear. COGITO CLASSIC frees you from continually checking your phone, and the beautiful, classic watch face displays who is calling and gives the option whether to answer or mute the call. Making life even easier is the fact that the COGITO CLASSIC is one of the only smartwatches on the market that never needs to be charged. Using a standard watch battery that is easily replaced when needed, hunting for an outlet or charging cable becomes completely unnecessary. It’s the only smartwatch with a design that looks forward to the future while paying tribute to the past. Check them out at cogitowatch.com!